After qualifying as Health Coach with The Institute For Integration Nutrition in 2013, Emma took her passion for all things health and wellness related and love of travel to help hundreds of men and women stay fit, healthy and organised while traveling for work, business or pleasure. After spending my formative years in a teeny-tiny village in the U.K., my adventurous spirit manifested into full-time life on the road. I spent years traveling the world overland, mainly on two wheels working as an adventure Tour Leader and learned a lot along the way which led me to create a unique, compassionate, community-driven company with a strong sense of social responsibility. 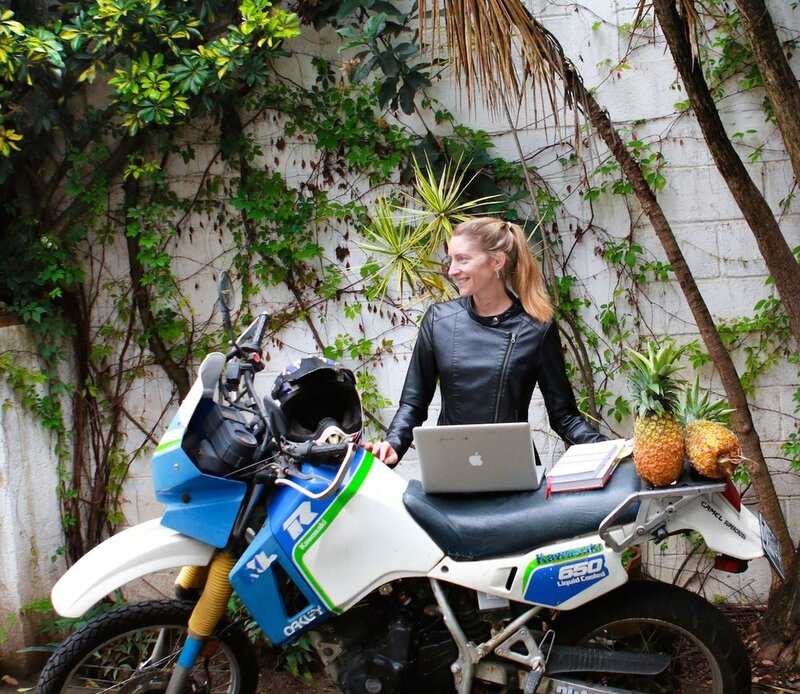 Around seven years ago I set up an adventure travel company in Guatemala, which I’m proud to say went on to receive various awards and international recognition, and at the same time I was studying to become a Health Coach with The Institute For Integrative Nutrition on the side. These two worked in tandem for years, and I’ve realised that it all comes down to my curiosity of what makes people thrive, what their struggles are and how they overcome them. Helping others make progress in their lives is important to me so please don't be afraid to reach out. I’ll never fit into one conventional box which benefits you because I’m in a great position to come up with creative solutions having so many perspectives to draw from, it’s also why we adventure way beyond topics like food and nutrition around here — because there’s so much more to healthy living than green smoothies! Food is important, of course. (I LOVE food) but to truly thrive, you need to feel empowered to make decisions that support your health, fitness and lifestyle goals, you need to be free to move past annoying constraints and old ways of being, so you can finally get healthy for good on your own terms. I continue to learn new things every day and expand my knowledge of what it truly means to live fully which is why I’m dedicated to building products with a purpose that you get lifelong access to — my company is built on compassion and fuelled by collective wisdom. But I’m not perfect. I don’t always have all the answers, and we all have our off days, but I’m committed to trying to better myself with every new client I work with, book I read, country I travel through and conference I attend. Hopefully you don't expect to be a pro at getting the whole health and fitness thing right overnight. I also hope you know that with a game plan, support and motivation, you'll get there faster than you think. If you’ve got this far — thank you! Be a healthy traveller — click on this link to sign up for news, updates and more healthy travel goodness! I respect my time in your inbox and you’ll only hear from me once a week unless there’s something time-sensitive or exciting I have to share with you. Thank you so much for taking the time to visit. I’m looking forward to the journey ahead — see you on the inside. Un abrazo fuerte (that's a bear hug).